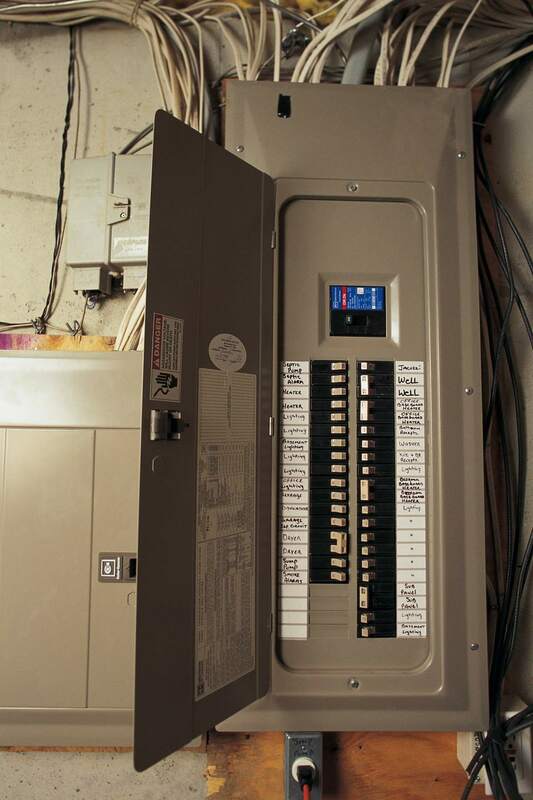 A service panel is the circuit breaker or fuse box in you home that not only distributes branch circuits throughout your home, but also has the ability to turn the entire home’s power off. It should be located in a convenient place in the home where it can be easily accessed if you need to get to it. It also should be placed somewhere out of the reach of children, moisture, and dirty areas. All wires should be attached to the service panel with cable clamps and securely fastened. There should be no open holes in the service panel box housing or any unused breaker space holes. These areas should be covered with knockout plugs or circuit breaker blanks. Circuit wiring should always match the circuit breaker or fuse it is attached to, meaning the breaker or fuse amperage should never exceed the rating of the wire. If you find that a 20-amp breaker has been connected to a 14-gauge wire (rated for 15-amps), this breaker should be changed to a 15-amp breaker. This may indicate that the circuit size wasn’t large enough to handle the load required for that circuit and rewiring the circuit to a heavier gauge may be the next step. It is acceptable however, to have a 15-amp breaker on a wire rated for 20 amps. This is often done when voltage drop is a consideration. Make sure that wires are run in a neat and orderly manner from the service panel. Be sure that the wires are secured by wire staples or other approved fastening devices. Wires should not look like a rats nest and intermingle every which way. You can straighten these wires out and reroute them one at a time. If it seems to be too much for you to accomplish, don’t be afraid to call in a professional for his help. Check the wiring to see that there are no open spices or nicks in the wires. Be very careful when handling the wires as you inspect them. Remember, these wires are likely live and bare areas on the wire can cause you to become electrocuted. Any defective wiring should be turned off and replaced before putting it in service again. Another thing to check on the wiring is signs of overload. It is likely that you will notice the wiring melting, signs of fire, or at least a hot plastic smell. Excessive moisture and wire connections don’t mix either. Water causes rusty connections that cause heated wires and ultimately electrical fires. Moisture also causes corrosion on connection points that can cause poor connections. Be sure that all neutral, ground, and hot connections are tight. To do these connection tests, you may want to turn off the breakers one at a time as you tighten the hot feed wire connections. A loose connection will spark, sizzle and sometimes show signs of arcing. Any aluminum to copper connection should have ant-oxidizing agent placed on the connection. Penatrox and other trade name products stop this oxidizing process from happening. Warning! If your home employs aluminum wiring, connection points should checked regularly. Aluminum wiring is much softer than copper and connections often loosen up with heat. Loose connections can lead to electrical fires in homes.